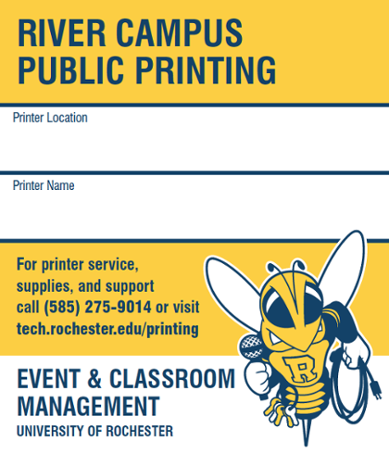 Event and Classroom Management (ECM) acts as your first level of support for public printing in classrooms, labs, and libraries on River Campus. Color and black and white printing is available in computer labs and at kiosks across the University. Prints are charged at a per-page rate to either a URos (Flex) account or Visitor account balance. If you are experiencing an issue with the pay-for-print system please call the ECM help desk at 585-275-9014, or enter a ticket directly using the online service request form. After logging into Service Desk, select "RC Public Pay-For-Print Request" from the "General Action" drop-down. Please note that ECM only maintains the River Campus public pay-for-print system. For other printing support at the University of Rochester please refer to the contacts below with your inquiry. Photocopier support- please follow the contact instructions on the device. Non-pay-for-print devices on the River Campus- contact the University Information Technology helpdesk at 585-275-2000 or your departmental desktop support staff directly.